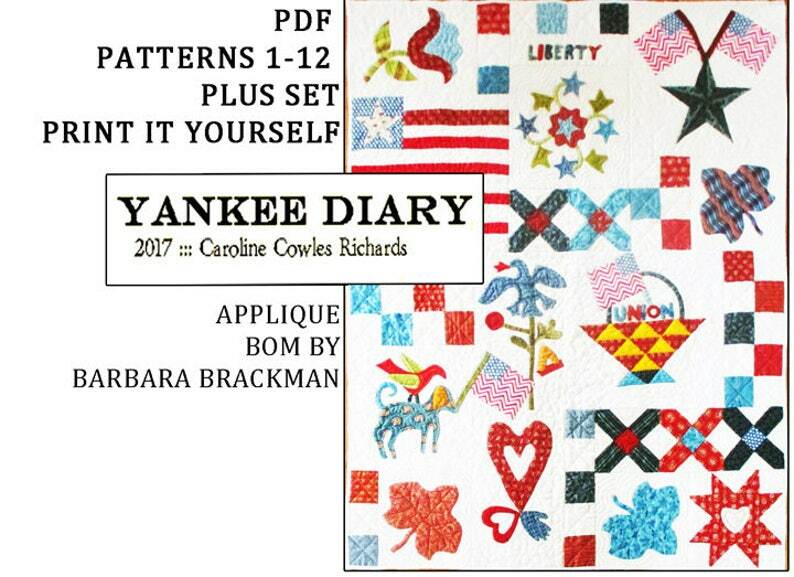 YANKEE DIARY BOM Civil War Quilts All Patterns 1-12. A pdf you print yourself. Traditional applique with a modern set. This listing is for all the patterns, set & optional border from my 2017 BOM Yankee Diary, a Civil War reproduction quilt with a contemporary set. You get a PDF you can print out on your home printer. The mostly applique patterns are based on patriotic Civil-War-era quilts. The stories are based on a girl's diary 1854-1865. Caroline Richards lived in Canandaigua, New York and tells us about the Civil War from a well-to-do New Yorker's perspective. Purchase the whole set as a PDF for $18. You get 22 sheets 8-1/2" x 11" with pattern, border & set pictures, cutting and sewing instructions. Plus a little bit of the Yankee Diary story. For more of the stories & more block pictures check my blog Civil War Quilts on the last Wednesday of each month in 2017. If you would rather have paper patterns mailed to you can buy them in another listing. Click here to see a listing for that $24 packet (includes postage) for all the Yankee Diary patterns. 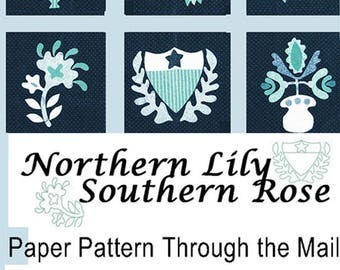 Northern Lily/Southern Rose. 9 Traditional Appliqued Blocks North & South from Barbara Brackman. Civil War Reproduction Quilt Pattern. DIXIE DIARY BOM Civil War Quilts Sampler. 12 paper Patterns by Mail Original design by Barbara Brackman, quilt historian & fabric designer. Threads of Memory. 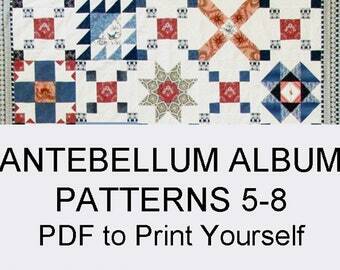 Civil War Quilt Pattern PDF BlockoftheMonth Sampler. 12 pieced star designs. Prompt delivery, reasonably priced. Looking forward to starting this lovely quilt. Juniper and Mistletoe: A Forest of Applique BOM. Menaugh & Brackman. Primitive yet modern trees and birds from traditional quilts. How-to. I ordered this book on a whim and love it and the history of Emporia and the Kretsinger Family. I used to work with Rose's grandson! Excellent service getting it to me - although I may have been a little impatient! Great pattern, great seller, prompt delivery. Threads of Memory. Civil War Quilt Pattern Paper Patterns through the mail. 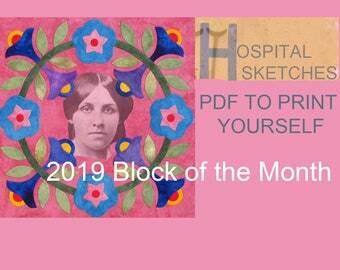 BlockoftheMonth Sampler. 12 pieced star designs. 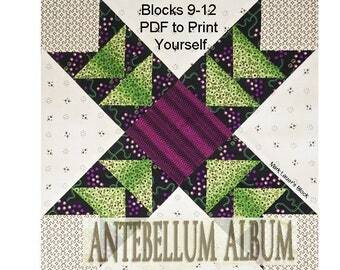 Antebellum Album All Patterns 1-12. 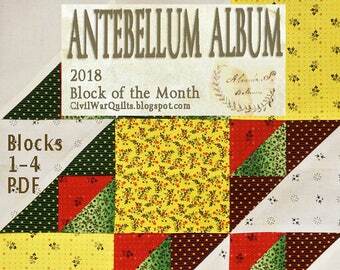 2018 Block of the Month from Barbara Brackman's Civil War Quilts Blog. Paper Patterns Through the Mail.